One of my favorite starving artist past times is taking recipes that are perhaps a bit…. over-involved or over priced or just plain obnoxious and making a starving artist version that is just as tasty for a fraction of the cost and time. 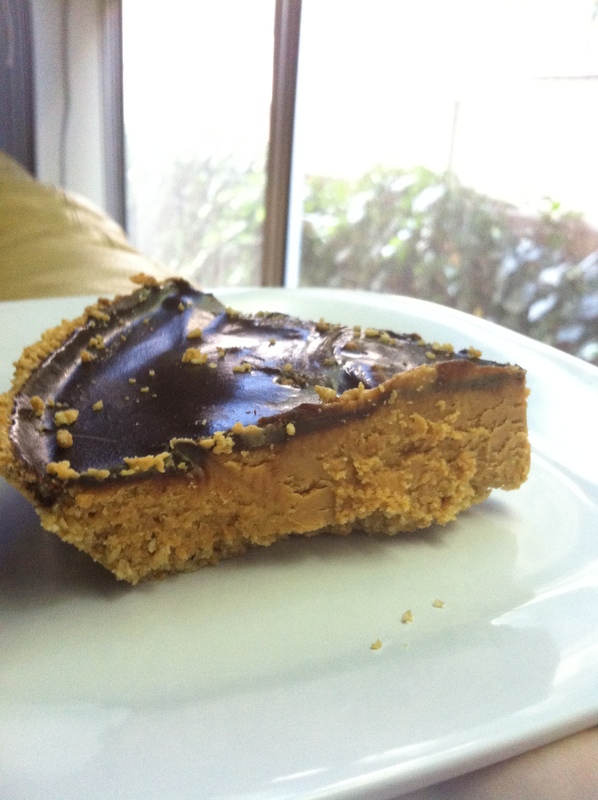 Many weeks ago, long before bootcamp and certainly at a time where I was not at all concerned with what I was eating, I got a random craving for a peanut butter pie. Now the responsible thing to do when a craving like this hits is to recognize that it is born of misplaced desires and emotions and simply ignore it. Or you can behave completely irrationally and immediately leave your house to purchase ingredients. At this stage I went with option 2. Crust: do you know how expensive those chocolate wafer cookies are? Like over $5 for a pack. No. I bought a pre-made crust on sale for $2.99. They didn’t have chocolate, so I used granola. Perfect. Peanut butter: I’m sure Alton’s homemade version is fantastic, but I’m not buying and roasting peanuts. Please. 1.5 cups from a $3 jar of Jif. Done. Bittersweet chocolate: I always have bulk semisweet chocolate chips in my kitchen. Those worked just fine. Using all these substitutions I followed the recipe as it’s written and I have to say, I had a perfectly splendid peanut butter pie. Sorry, Alton!